This sounds so unbelievably exciting! Good luck in all that you do, you’re going to have a fabulous time ? It’s a bit scary too. Thank you!! Thank you! No I won’t. I won’t be in London till July. Maybe next year. It’s a big bold decision. But, something I will back you up for always. Because if you don’t take the risk you will never know . Wishing you all the best and as always will see you on social ? It is! Thank you! Exactly. Ms. Hala recently posted…Ciao Italia! Exactly! I keep telling myself if I don’t do it, I will never do it. Brave! I’m sure you’ll find a good way to make things work for you. Best of luck. Yes, that is the plan! Thank you so much!! I definitely would be scared sh*tless! But it also sounds liberating especially being able to travel as long as you want. Good luck with everything! I am scared but not scared enough to not do it. Lol. Maybe crazy, though. Thanks! Wonderful! Hope you enjoy the blog. It is scary to leave it. I’m so glad you are happy you left. Thank you so much! Good for you! I hope you have an amazing time travelling! I’m leaving London in June, so I am sad that I won’t cross paths with you. Ah well. I can follow your adventures on here. Give me a shout if you make it over to Canada! Or if you need any advice on good walks near London!! Thank you! Oh that’s a shame. Good luck on your adventure in Canada. hey Tiffany, that’s super exciting! I don’t know much about quitting as an expat but I know about following your heart tells you to do. So, good luck! London sounds best to get started with. Looking forward to read more from you and know that your readers are with you in this journey. Hugs! Thank you so much. This is my first time quitting an expat job. I can’t wait to start traveling. Big decision, but maybe this is the start of something amazing, and how would you ever know if you didn’t try! Exactly and I would always regret not trying it. Thanks!! Congrats on making a huge decision! I’m sure it will work out, and you’ll have a blast doing it. So excited for you! Thank you! I am sure it will too. Big move!!!!! It’s much needed if you finally decided to stick with your plan…All the best as you exceed limits….looking forward to reading about your experiences..
Best of luck with it! You will never regret travelling! Life is for living, go for it! Wow! It’s interesting, isn’t it, how we know exactly the moment we have to move on. I hope you enjoy your time travelling. Yes, it is interesting. Thank you! I totally understand that feeling. Even we feel that its time to go and leave Qatar. You are brave to do it now. I wish you all the best and good luck to your next journey. We all have to leave Qatar eventually. Thank you! 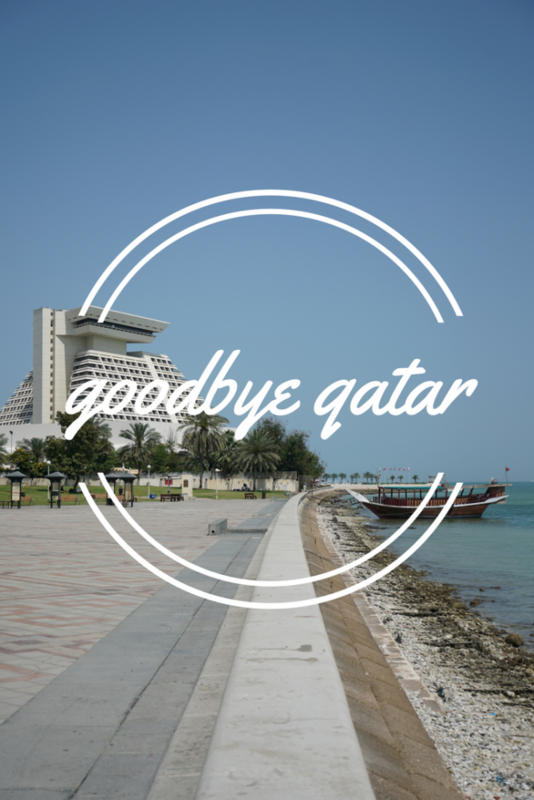 Once you fall out of love with Qatar, the decision to leave is easy. Four years seems to be one of the consistent tipping points. Good luck for the future. I still love it here but can see that it may not last so I want to go while I still like and don’t hate it. Thank you! What a surprised!! I read your blog right away the moment I saw it. I wonder why. Yes, it’s true, a feeling that won’t go away then it’s time to act on it. I feel it many times to my husband’s horror haha! but yes, of course, guess it’s a different situation. Anyway, I wish you all the best to come. I may do the same if I am single and younger haha! I am sure all expats have this feeling at some point. Thank you! Soooooooo proud of you! Looking forward to meeting you too! Thanks so much! I can’t wait to meet you. Wow – big decision…look forward to hearing the next part of the adventure! Matt recently posted…Don’t be Jel…be Reem! So excited to hear about your next adventures Tiffany! Exciting new adventures await! Good luck to you x ? Wicked exciting, Tiffany! I can’t wait to live vicariously through your travels. A few years back, I tried to convince hubby to quit his job, so we could travel the country in our tiny camper with our not-so-tiny kids, but it wasn’t in the cards for us. But the feeling while we contemplated it was absolutely glorious – how cool that you get go on this amazing adventure! Thank you! I can imagine that doing this with kids could be hard. I will be sharing tons so hope you will follow along. Good for you! I took a year off from my job last year and didn’t really have a clear idea of where I wanted to go but it all came together once I got started. It was a fantastic year and something I hope to do again. Looking forward to reading about where you go and seeing your photos. Thanks! I am so glad to hear your year off worked so well. Did you travel? You are so lucky to have parents who support you and push you like that. My parents would be like “yes, you need to keep your job and build security.” They are old school like that. You will have no regrets! I am very lucky! Thank you!! Thank you so much! I can’t wait to get started. I was reading Susie Speaks and read a little bit about you. My sister used to work in North Africa for an oil company (work a month, go back home for a month). She loved it but hit a mandatory retirement age. When you have the “travel gene” you just go with it. (Her motto has always been: It’s an adventure!”) Then, one day, you’re living on a small pension and the only place you’re traveling is to the grocery store and back. Thanks for stopping by! I like your sister’s motto! Everything is an adventure and we should all do as much as we can. You only live once, right! On a whole other note, sounds like your timing of leaving Qatar is pretty fortuitous! It was huge. Thank you! Yes, today seems like a good time to leave. Congrats on this new chapter, it’s definitely a hard decision to make! As a expat in the UAE I know how comfortable you can become! Wondering if Qatars political crisis had any bearings on your decision? I made the decision long before the crisis happened. It started about three weeks before I was scheduled to fly out. It was a sad end to a happy four years there. Obviously it’s been a couple months since you made this announcement, and I hope everything is going swimmingly. I just recently returned from London, and I would LOVE to have been able to stay there longer! It sounds like you’re in for quite the adventure! Can’t wait to hear more about it! Becca @ The Married Cat Lady recently posted…London, Baby! Everything is going well so far! My time in London is almost up but it has been nice to be able to see more things than I would have if I had only been here for a week or so.